against your better judgment you came to believe it? that stuns her room, floods your own. your faces, a map of the new one. Again and again, the sacred falls into the muck of the human lotus pond. against demise . . .
“Song” begins with an epigraph from Nietzsche: “Without music, life would be a mistake. Almost Human hums with life, but also otherworldliness, with connections and disruptions, with beautiful, but dismissive neighbors and acquaintances, and with the sensual and cerebral. Centolella provides views beyond the tangible with exceptional craft in this collection that takes on a deeply profound topic of existence. You have received prestigious distinctions in poetry, including a Wallace Stegner Fellowship, the Lannan Literary Award, numerous book awards (one of them chosen by Denise Levertov for the National Poetry Series), and books published by Copper Canyon Press. Yet, it took time to secure publication for this current volume, Almost Human. Tell us about this process. It was exactly 15 years between the publication of my third book and my fourth book. The short version is that I was derailed by the editor of the press that brought out my first three books, a man who acted in an outrageously unprofessional and reprehensible way. I’d had a fine 20-year relationship with this press until this editor shamelessly lied to my face about his interest in my fourth book, and then, after keeping it in limbo for three years, unceremoniously gave it and me the boot. I wanted to see this editor’s notes that would reveal why he’d changed his mind and found my book suddenly “unconvincing,” and he couldn’t even find my manuscript! What I discovered through various sources was that this editor was intent on purging the press of a number of veteran writers in favor of promoting younger, “hipper” ones. I’m reminded of what an old friend told me, someone whose poetry is widely respected and admired: “Editors are not our friends.” Again, that’s the short version. Did you know Denise Levertov? What was she like? Denise Levertov was one of my teachers at Stanford when I was a Stegner Fellow. Her intelligence was unmatched in the classroom; her perspicuity would cut laser-like through any attempt at gimmicky obfuscation in the name of innovation. She was sparing in her praise but when she gave it, it was heartfelt; you could see the delight on her face and that would make you want to work harder. In private, that delight was more evident. Denise had a lovely talent for giving her full attention to whomever she was engaging, asking questions of the person, drawing them out. And her laughter, almost girlish, was infectious. She was revered by those who knew her, but here’s the thing: she never behaved like someone aware of just how important she was in our political and literary world. I’ll always be in her debt for her support of my work, which lasted through my first two books, until lymphoma took her, 21 years ago. I still haven’t crossed out her name in my address book. What was the impetus to write a collection of poems about spirit and humanness? Did you encounter any craft challenges in creating these mystical poems and putting it together as a book? This is such a good question. I’m never quite aware of what exactly I’m doing when I’m in the midst of writing a book. For me, a book is written poem by poem, and without the overarching vision of a predetermined theme. But funny enough, a theme always does seem to emerge. I sent a batch of early poems from Almost Human to Jane Hirshfield, and she said, “Are you writing a book about the gods?” It hadn’t quite occurred to me in that way. But over time the theme emerged, underscored by the book’s epigraph, attributed to Teilhard de Chardin: “We are not human beings having a spiritual experience. We are spiritual beings having a human experience.” (An epigraph, by the way, I found after the book was done.) What helped me get there was sitting down one day and writing whatever came into my head—quite the opposite of my usual m.o. What ensued was a series of 21-line meditations, often in a mysterious voice that came more through me than from me. This openness to something other than crafted autobiography, which often results in a narrative poem, freed me to explore diverse tactics in the longer pieces, like “Spirit,” which takes full advantage of that word’s multiple meanings, never declaring if we are listening to a human being speaking or something nonhuman or a commingling of the two. You’ve been a voice in poetry for many years now and have seen evolution in the poetry world. How would you summarize the biggest, current changes? In recent years the publishing industry has seen an influx of underrepresented writers—a good and necessary thing. What is not so good is the preponderance of poets, especially the younger ones, whose work doesn’t move significantly beyond what F. Scott Fitzgerald might call “the merely personal.” And for me that’s even true of many writers who have a striking style. Style does not equal substance. Neither does the kind of automatic cultural status that publication tends to confer. Another noisome change in the poetry world is the ubiquitous self-promoting that goes on through social media. It was actually part of my contract with Tupelo Press that I vigorously promote my book through social platforms—which I have done, albeit begrudgingly. It feels slimy to nudge whoever is out there to pay attention to how worthy one’s work is, whether I’m the nudger or the nudgee. Of course you can argue that Twitter, Facebook, et. al. provide a heretofore unparalleled exposure for authors. But if my praises are to be sung I don’t want to be the one singing them. I prefer spending my time writing poems rather than promoting them. Is there any question that nobody asks you that you wish they would ask? 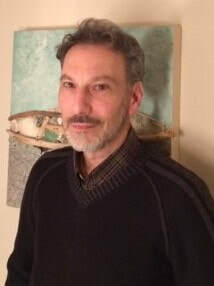 Thomas Centolella is the author of four collections of poetry: Terra Firma, Lights & Mysteries, and Views from along the Middle Way, all published by Copper Canyon Press; and Almost Human (2017), which won the Dorset Prize from Tupelo Press, selected by Edward Hirsch. His honors include the American Book Award, the Lannan Literary Award, the California Book Award, the Northern California Book Award, and publication in the National Poetry Series. His work has appeared in numerous magazines and anthologies and on Garrison Keillor’s The Writer’s Almanac. A former Stegner Fellow at Stanford University, he has taught creative writing and literature for many years in the San Francisco Bay Area, including positions at the Institute on Aging, where he worked with dementia and Alzheimer’s patients; in the California Poets in the Schools program; and at WritersCorps, where he worked with at-risk teenagers. He currently teaches at College of Marin and in private workshops.